The development of Arabic calligraphy led to the creation of several decorative styles that were designed to accommodate special needs or tastes and to please or impress others. The most outstanding of these techniques or scripts are Gulzar, Maraya or Muthanna, Zoomorphic, Siyaqat, and al-Khat al-Hurr. Gulzar is defined by Safadi (1979) in Islamic Calligraphy as the technique of filling the area within the outlines of relatively large letters with various ornamental devices, including floral designs, geometric patterns, hunting scenes, portraits, small script, and other motifs. Gulzar is often used in composite calligraphy where it is also surrounded by other decorative units and calligraphic panels.A Persian piece in "gulzar" calligraphy from the later 1800s "Iran, second half of the 19th century. Ink, gouache and varnish on cardboard. 12 1/2 x 18 1/4 in. Private collection. Falk (1985), 179, p. 192. The beauty of the Arabic alphabet is entirely intrinsic. It can be appreciated for its formal and rhythmic qualities alone and needs no embellishment or decoration. But both Iranian and Ottoman tastes, particularly in the 19th century, put the Arabic alphabet through some strange contortions. Scripts were covered with representations of people, animals and even tiny scenes. "We came this way searching for glory and power." The script is decorated with animals, people and landscape in a griasille technique on a plain background. In his original verse, however, Hafiz wrote the opposite: "We did not come..."
The origins of Gulzar script are perhaps to be found in a technique known from the 16th century at least, whereby phrase such as the basmalah was filled with minutely written Qur'anic verses. Gulzar in the form shown here seems to have been practiced since the 17th century. There is a piece in the Chester Beatty Library, Dublin (Ms 11A:3) bearing the name of the Mughal Emperor Shah Jahan." 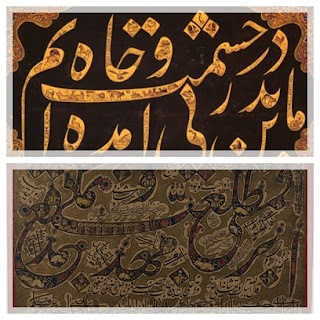 Maraya or Muthanna is the technique of mirror writing in which the composition on the left reflects the composition on the right. Siyaqat is another style developed and favored by the Ottomans; it was used in chancelleries and courts. Siyaqat has a close affinity with Kufic script where the lines are straight and heavy and relatively angular. 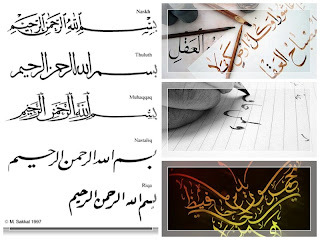 Al-Khat al-Hurr may be the most modern calligraphic script and was developed in different parts of the Arab world in the 1980s. This free-style script does not follow a pre-set pattern but typically is elegant and highly stylized. It is excessively cursive, and the curves display marked contrast in line width. A curve might change abruptly from the heaviest possible line a pen can create to thethinnest possible line from the same pen.